"Just terrific! It sustains so much color and culture in one place and has transformed the area. We love the energy and that it looks beautiful with water or not. The overhead shade structure is striking and really makes it a memorable place." 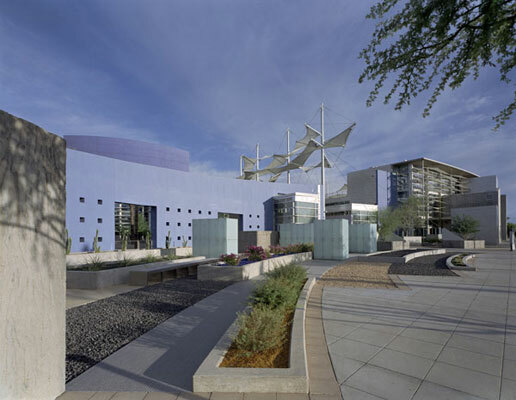 Mesa Arts Center exemplifies what is possible when the community, client, and design team collaborate from the project’s inception. This collaboration is apparent in the strength of interplay between the outdoor and indoor spaces and how they provide for the Center’s program directives of performance, exhibition of visual arts, and education. 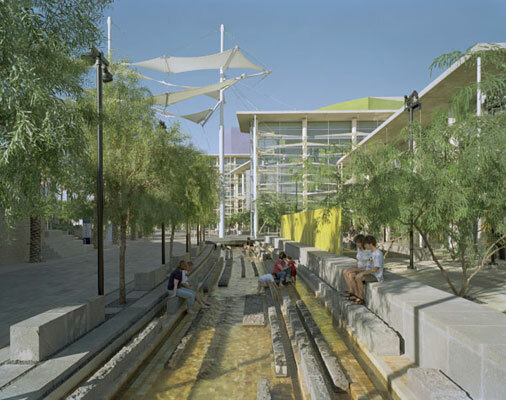 Drawing a strong identity from the surrounding dry Arizona landscape, issues of downtown regeneration and sustainability are addressed in the site’s design. 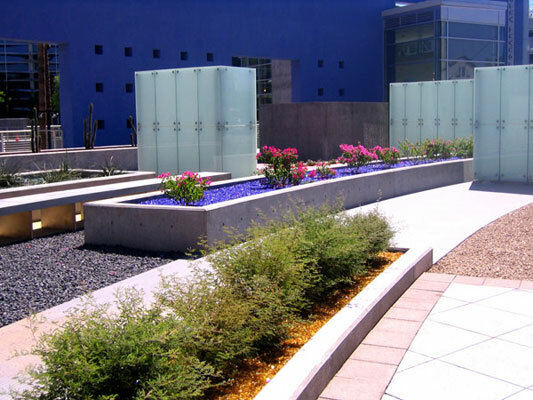 A few years ago our firm welcomed the challenge of designing the landscape for the Mesa Arts Center in Mesa, Arizona. Mesa, for all intents and purposes, a “proto” Phoenix, is a rapidly developing “sprawl” without a center or identity. The 2004 US Census estimated Mesa’s population at 437,454, an increase of 51 percent in just under 15 years. Today Mesa stands as the largest suburban city in the country. Mesa had previously lived without a central core. There was no destination place for residents and visitors. When community members were asked to identify the physical space that represented the heart of Mesa, most pointed to the recently completed shopping mall. The city leaders fortunately realized that, in order to retain a population and attract future inhabitants, Mesa had to reinvent itself through substantial urban regeneration. Working in close collaboration with the architects, our team was directed to create a visually and socially vibrant nucleus that would transform the city center. The site was to contain three performing arts theaters of varying sizes, a community art gallery, and a school. In addition, the project leaders envisioned a signature public outdoor space that could host shared, city-wide events while also offering outdoor space for smaller gatherings. What we jointly developed, after exploring at least a dozen different schemes, was a “geode” for the city, a central framework with a defined, solid exterior, containing a magical gem as its inner space. This structure was to provide a street wall for a city that had a lack of density and was in need of spatial definition. What resulted was a block of development that created a street wall along both Main and Center Streets thereby establishing urban density. This block was then “carved” or “cracked” to create an elaborate passageway with a civic space that functioned as a street and entry spaces for the three theaters. This passageway evolved into a “Shadow Walk,” a grand promenade that runs through the building complex in a bold, arching gesture. 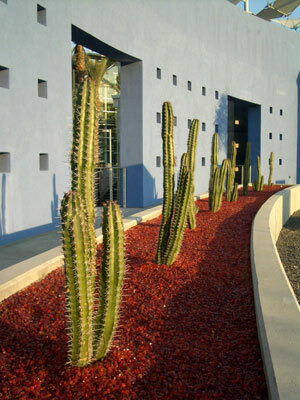 In the desert southwest, the intense sunlight is the strongest characteristic of the environment and the resultant shadows became the fundamental basis for the design. 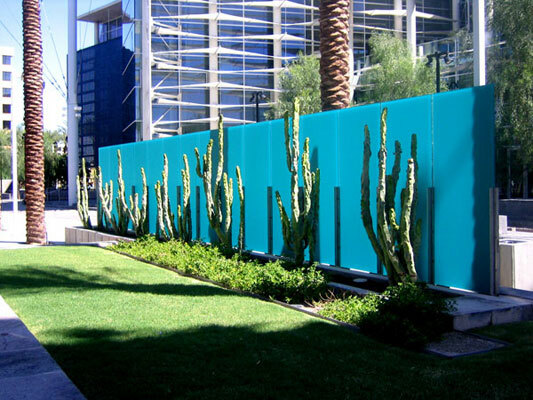 The concept was to display plantings in a way that would best dramatize their shadow patterns and also to create spaces that would be comfortable for people. 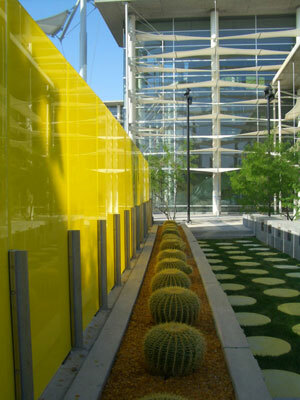 The plantings, like the performers on the three stages of the Center, would actively participate in the drama of the space. 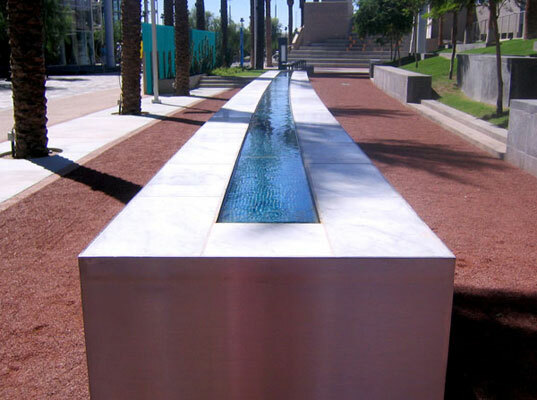 Our “Shadow Walk” provides opportunities for both large and small group gatherings, performances, art exhibits, smaller “parklets” for quiet relaxation, and water features for enjoyment. 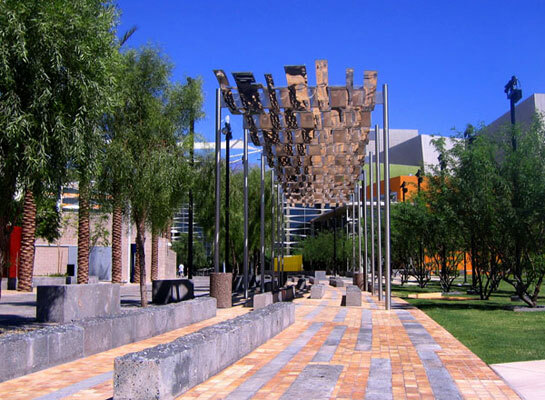 A rich interplay of overlapping shadows, trees, tensile canopies, and trellises creates a cool oasis in the dry desert landscape. 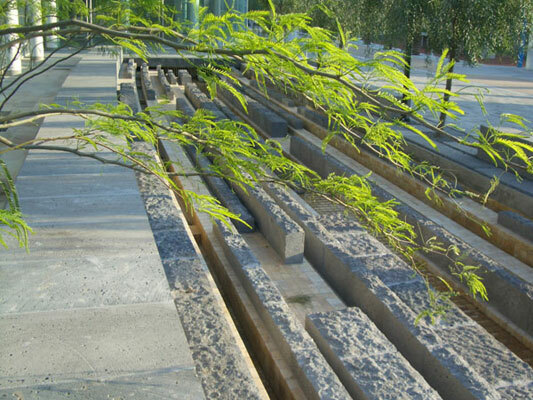 Paralleling the Shadow Walk is the “Arroyo,” a 300’ long water feature whose narrative is appropriate to the southwest and is expressed as a dry creek bed lined in gold travertine tile and slices of lava rock. Typically, as in the desert, the creek is dry, but is periodically filled with a rush of water from north to south, recalling the flash floods characteristic of the region. After the flood, the water empties, and eventually the cycle begins again. 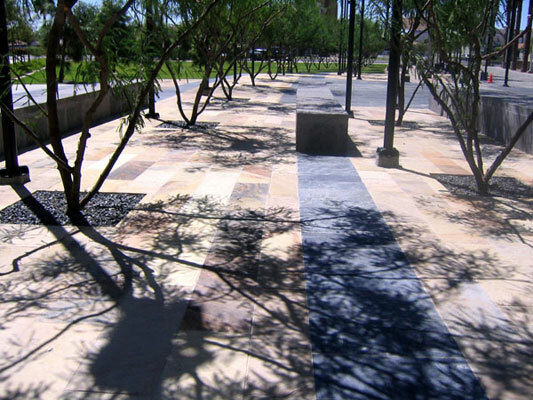 The cooling effect of the water and the canopy of shadows are a welcome design feature as Mesa averages 300 sunny days a year, 90 of which exceed 100 degrees Fahrenheit. Another motif running through the Shadow Walk is that of the banquet table, an element that appears several times throughout the plaza. The banquet tables are long, thin stainless steel tables with a running water slot in them, much like the water-table in Villa Lante. They are meant to be gathered around and leaned upon, and create more formal social situations closer to the theaters. 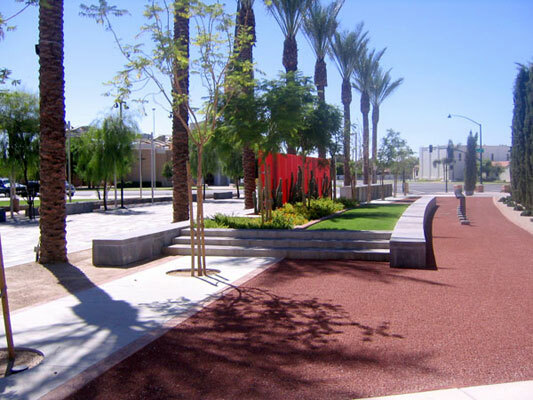 The formal elements of the plaza are intended to create a poetic statement about the coming together of people and environment in a new active space for Mesa. Its goal is to create a new image and to function as the heart of the community. 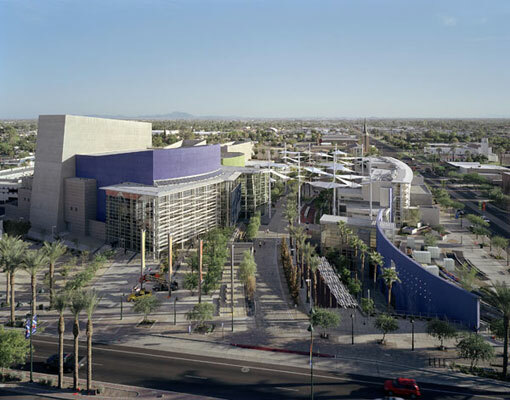 The Mesa Arts Center officially opened to the public in September 2005. 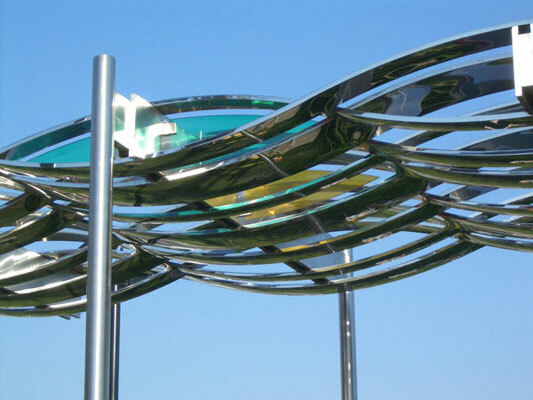 It has already begun to take its place as a downtown destination and gathering place, instilling a sense of pride in the people of Mesa and generating tourism and revenue for the city. 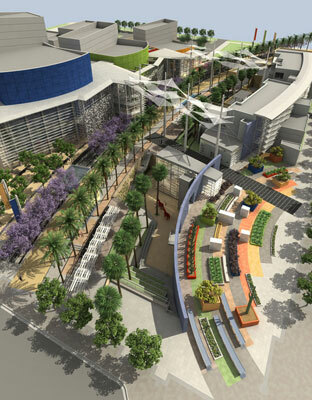 Mesa stands as an example of what we hope to be the beginning of a new wave of smart urban development in the United States. .